If you do not wish to vote at this time, click here to visit Tycoon Online stats. 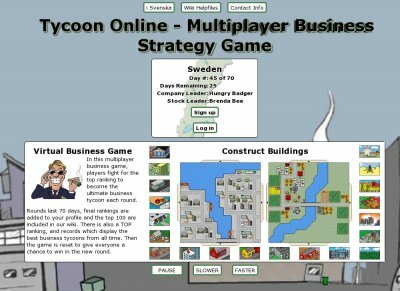 Tycoon Online is a business strategy game. Players create their own business which operates factories and shops, carries out transport assignments, and offers services. As your company grows, you can sells shares of company stock, buy stock in other companies, and buy and sell produced goods on the market. Your goal is to build the biggest company with the highest value. By aggressively expanding and outdoing your competitors, you can become the #1 Tycoon. Tycoon Online is a non-violent game that is great fun for players of all ages. We have a friendly and helpful community. TO is free to play, but a premium membership is available for just $8, but it is NOT pay-to-win.